Gooseberries a type of berry related to the black currant is harvested in Hokkaido and the Tohoku region, Japan. 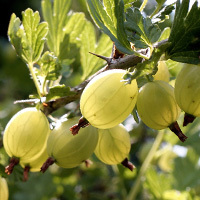 Unripe gooseberries are said to be yellowish green. When ripe gooseberries turn the color purple. Although not as prevalent as other berries like blueberries, gooseberry jam can be bought in some grocery stores. The calories in Gooseberries per 7g(1item edible part) is 4 calories. Gooseberries is calculated to be 52Cal per 100 grams making 80Cal equivalent to 153.85g with 0.92g of mostly carbohydrates、0.07g of protein、0.01g of fat in 7g while being rich in vitamins and minerals such as Vitamin C and Folate.